Fibromyalgia is a serious chronic condition. This is why there are many fibromyalgia symptoms that usually vary from one person to another. However, there is one main symptom of fibromyalgia common for everyone and this is the widespread pain. The symptoms of this condition may get better or worse, depending on the way you live your life and your environment. Some of the factors that can change your symptoms include: your stress levels, your physical activities and weather changes. As soon as you take a peek at these signs of fibromyalgia mentioned below, you will have an idea how the condition is experienced. If you think you have this condition, make sure to visit your GP as soon as possible. There is fibromyalgia treatment that can help you ease the symptoms, even though there is no cure. If you are wondering ‘what are the symptoms of fibromyalgia?’, take a look at the list below. We are first introducing the most common, main symptoms of this uncomfortable chronic condition. If you are yet another patient of fibromyalgia, this is going to be one of the main symptoms you will experience. However, the manifestation is different from person to person. You may feel pain throughout the body or in particular area. In most cases, the pain is felt throughout the body, but it is worse in some areas like the neck and the back. This pain is continuous and you will need treatment to make it go away. In some cases, it can become milder or more sever at different times. People diagnosed with fibromyalgia have stated that they feel throbbing, sharp, stabbing pain, an ache or even a burning sensation at times. So, even the pain representation in your body may be different from that of another fibromyalgia patient. Fibromyalgia can cause patients’ extreme sensitivity to pain all over their bodies. This means that even the slightest pinch or touch can be painful. Also, pain that usually goes by after a while may not leave, like for example if one hits their toe. In cases of fibromyalgia, this fibromyalgia symptom may last for much longer than it normally would last. This symptom is also referred to as hyperalgesia or allodynia. The first one is used when a person is extremely sensitive to pain, while the other one when a person feels pain from a light touch or something that should not be painful whatsoever. This sensitivity does not solely need to be applied in terms of pain. People with fibromyalgia are also sensitive to some things, including lights, certain foods and smoke. Aside from leading to uncomfortable sensation, being exposed to things you are sensitive to can also flare up some of the other symptoms you are experiencing. The stiffness of fibromyalgia ranges from mild to severe, but it is definitely one of the most common signs of fibromyalgia. This symptom may move from mild to severe in different times of the day or after you have been in a same position for a certain period of time. This is why fibromyalgia patients often experience stiffness when they wake up. Additionally, this can cause the muscles to contract and start hurting. This is called a muscle spasm. You may also experience extreme tiredness, also referred to as fatigue. This fibromyalgia symptom can also range from mild to severe. In the first case, the patient is feeling tired, similar to the exhaustion we feel during some illness or the flu. In the latter, it may come suddenly and kill of the entire energy of the patient. When this happen, you will not be able to do anything at all. Fibromyalgia can really affect the sleep of a patient. Even if you manage to fall asleep, which is not often an easy task because of the pain, you may still wake up tired. This can happen even when you have slept for sufficient amount of hours. This happens because you cannot sleep deeply and do not get quality rest. This is also referred to as ‘non-restorative sleep’. Aside from causing severe sensation of pain in the neck and the shoulders, fibromyalgia often causes you to have headaches. The headaches that show as a symptom of fibromyalgia can vary from mild headaches to very painful, severe migraines. When it comes to migraine, this often comes in combination of feeling sick too. Many people with fibromyalgia tend to develop IBS. Irritable Bowel Syndrome is common digestive condition in people. What it does is bloats the stomach and causes pain. Additionally, it can lead to diarrhea and constipation. Having a chronic condition is not easy on anyone and it is no wonder that fibromyalgia can lead to depression. This particular chronic pain condition can be very difficult to deal with. Also, some hormones are of low levels in cases of fibromyalgia, which may also contribute to the patient developing depression. If you are suffering from fibromyalgia, you may start feeling constantly low, hopeless and helpless. There are things that you previously enjoyed that you now lose interest in because of your bad mood. If you start experiencing any of these symptoms, it is important that you request some help from a professional. This can be either your GP or a fibromyalgia healthcare professional. A study that combined 50 matched controls showed that there were certain conditions found to be unusually common for patients suffering from fibromyalgia. The first three on the list were anxiety disorders (70%), irritable bowel syndrome (34%) and migraines (22%). Chronic pain is what is diagnosed when the pain lasts for longer than three months. So, if you are suffering from chronic, never-ending pain for this long, there is a big chance you will be diagnosed with fibromyalgia. Widespread pain is the most common symptom of this condition. The pain may be mild or moving from joint to joint. People often describe it as ‘everywhere’ or ‘all over’. Sometimes, it is most severe in the morning, while some people experience it non-stop. Other people experience it at night. The other symptoms also occur different in different patients. Some come as a result of this particular chronic condition, while others come up as result of other conditions that are present at the same time. These conditions both worsen due to fibromyalgia and can cause its symptoms to worsen too. The National Fibromyalgia Association have checked for the most common symptoms of fibromyalgia in patients. 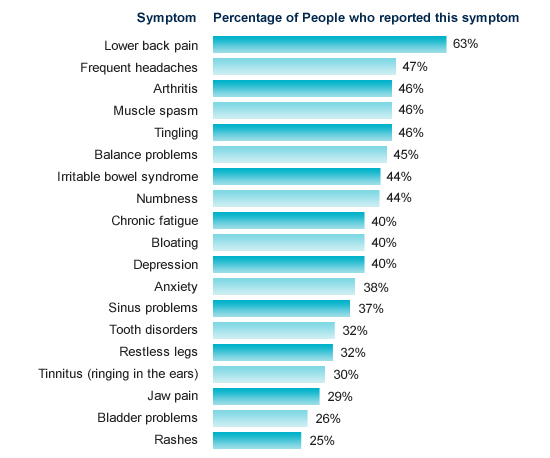 Most of them lead to chronic pain, but let’s check the percentage of their findings. All this leads to the conclusion that fibromyalgia is quite the uncomfortable condition. Right along the chronic pain that cannot really be cured, there are many other symptoms that can make the lives of patients miserable. This is why it is highly important that we take this condition into consideration, especially if we have someone close to us diagnosed with it.